There are traders who are raking in the profits right now, while others have missed out completely. With the right training and our unlimited ongoing support, you can learn the bulletproof trading skills and make serious money from the sharemarket. You'll easily trade every opportunity, safely and confidently, using your own bullet-proof trading plan. Plus, you'll know deep in your gut how to design and adapt this system - so no-one can ever threaten your livelihood ever again. Who's the boss? You are. And you've developed the trading skills to last a lifetime. If you feel scarred by the drudge, and you're ready to take control of your trading future, then you're in the right place. This could be the most important information you've ever read. 'Gain the confidence to excel as a trader'. Being ashamed of your portfolio's performance? Feeling brutally shell-shocked by changing market conditions? Attending other seminars, not getting the ongoing support you need, yet knowing that haven't yet cracked the code? Knowing in your gut that you deserve better trading results? will be a Whole New Beginning For You. Some people seem to leave their dreams behind when they move into adulthood. What a shame! Here is how just some of the people we've trained live their lives today. Rob McDonald follows the Formula 1 circuit around the world, trading as he goes. Karen Mardel has quit her job as a scientist. She now lives the life she always dreamed of. Peter Hunt now has financial security to allow him to spend more time with his family. Rather than struggling on his farm, Colin Simpson now lives the luxury lifestyle with his family in Port Douglas. These people are now our friends, having coffee with us in the middle of the day, travelling around the world, and developing the lifestyle that others think is only for the chosen few. And if you think that this is just hype - think again. These are real people, achieving real results, and if they can do it - why can't you? Well... it's not just because we have a combined trading history of 50 years. We all know that there are some excellent traders who have selfishly played their cards close to their chests. Those types of traders will never share their techniques with you, or anybody, for that matter. But here's the thing - to our knowledge, (and we’ve done a lot of research), we can’t find anyone who has created more successful traders than we have. So not only have we struggled for years and years to find out what works, and what doesn't - the good news is that we're willing to share these strategies with you! Our people are addicted to our methods. They stick like glue to our techniques. They've seen how they can make money in ANY economy. 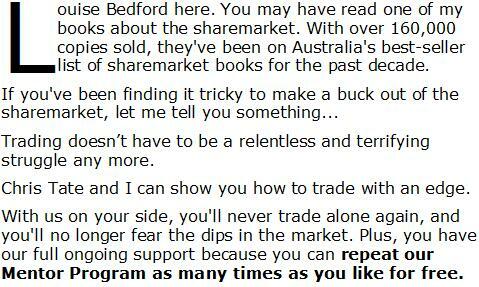 For some traders, the sharemarket is a hobby. For us - it's an obsession. And, over the years, as you learn and perfect your skills - we'll be right beside you every step of the way. PLEASE NOTE: The Mentor Program is restricted to a small group size, and we won't be running another one in 2019, so we can spend focussed attention with you. Also, there are certain pre-requisites you'll need to fulfil and, of course, there is a fee involved. Now, as you would expect, given the the fact that you've got the ability to repeat the Program as many times as you'd like - this opportunity is not inexpensive, nor should it be. One investment to provide a lifetime of results. Ever imagined the way your life could be, only to look in the mirror and find that real life is nowhere near as ideal? Have you dreamed of working only when you choose to, but then reality hits with a cold thud, as you drag yourself out of bed on Monday morning? "I greatly appreciate being able to repeat the course each year"
"I greatly appreciate being able to repeat the course each year in order to build on my knowledge and strengthen my abilities to create the future I envision. "The Mentor Program was fantastic and challenging and will enable me to reach financial independence and allow my husband to stay at home instead of doing "fly-in, fly-out". "Thank you both very much for providing such an informative, supportive course that allows us to build systems towards trading success while being supported and nurtured, tested and extended all at the same time." "...Jeremy covered the Mentor Program cost twice over in only 2 weeks"
"Every step of the way I felt safe, secure and confident because I knew that what I'd been learning through the Mentor Program was effective. I have covered the course cost twice over in only 2 weeks! "I can genuinely say that I have only achieved these terrific profits as a direct result of everything you have taught me. I can’t wait for the rest of the course and because I can repeat the Program for free as many times as I like - I know that this is only the beginning." "Thank you Chris and Louise"
"Simply put, the Mentor Program has started my journey to financial serenity and nothing is bigger or better than that. 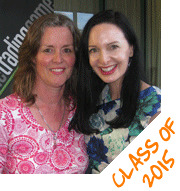 Thank you Chris and Louise, I have loved the interaction and can’t wait to continue the journey." Our traders are making money right now. In fact, many of them have made incredible profits even when the market was being pole-axed. It’s because they KNOW what others don’t. Get inside our minds, learn exactly how we trade, and come out of our training with a complete, bullet-proof written trading plan and our total support. In just 6 short months, you’ll feasibly know more than your accountant or your financial planner about how to make money out of the sharemarket. This 6-month course kicks off on Sunday, 10th February 2019. Then, we’ll have another meeting on the 5th May 2019, and a final meeting at the end of the program (25th August 2019), so we can all have the day together and have a great long lunch and a laugh. Other than 3 face-to-face meetings, the program is conducted on our exclusive, private, Mentor Program Forum, where you'll revel in the personal tuition that we'll provide. You'll learn in your own time, at your own pace, so it's ideal for crazy-busy people with a lot on. incredible support to our fellow traders.Because it's a small group, you’ll have the hands-on support that every exceptional trader requires to hit the ground running. You'll also create lifelong trading friendships along the way as well. as often as you like - for FREE! have just read one of my books or Chris’ books, and you haven’t placed a cent in the market yet, this course is for you. To make sure you've got what it takes, though, you’ll need to read the books Trading Secrets and The Art of Trading before we kick off. You'll be able to wrap that up in a weekend easily. Also, because the course will utilise the most up-to-date multi-media, you’ll also need a reasonably fast connection to the internet using broadband ADSL or a cable connection and a computer less than 3 years old. You'll need the Beyond Charts+ charting package as well. We have a dedicated software trainer, Scott Lowther, who will help you make this charting package hum. You can start the course using any charting package that you have access to, but Chris and I find that the best performing Mentorees buy Beyond Charts+ before the Mentor Program kicks off. Some of our Mentorees have covered the cost of the Program even before they've finished the first few months! Well done Paul! We're so proud of you. These people are making money in today's tumultuous market - while others are losing their shirts. You’ll receive brand new, completely up-to-date, never publicly released videos and podcasts to boost your learning curve. You can watch them again and again. Chris Tate and I have spent years developing the most sophisticated adult learning methods and trading systems available. We short-cut your learning curve, and get you trading profitably as quickly as possible. You will derive immediate benefit. These tools have been independently valued at thousands of dollars, and these are available to you for FREE when you participate in our Mentor Program. You’ll also receive choice extracts of our most popular trading products such as my The Secret of Candlestick Charting DVD Program (valued at $995.00), and The Secret of Trading Options Workshop (valued at $695.00), as well as my Trading Psychology Home Study Course (valued at $695.00), as we go through the program. This is the event that you'll wish you had attended 20 years ago. 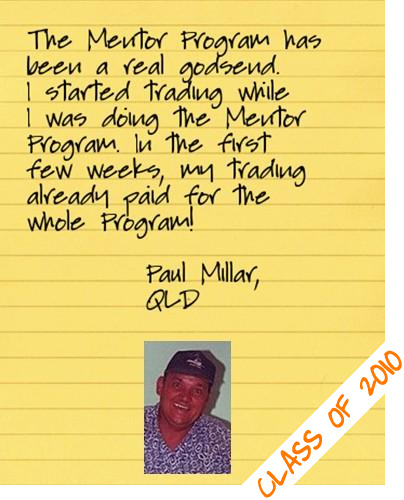 "I believe the Mentor Programme is excellent value for money in that you are likely to recover your costs in your first few trades. 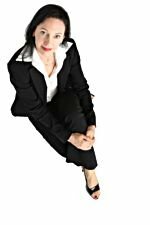 "I have had a buy and hold share portfolio for 17 years so I know lots about the sharemarket, but I still learnt heaps from the Mentor Programme"
"The Mentor Program was life-changing, empowering and confronting (in a positive, making-change sense). 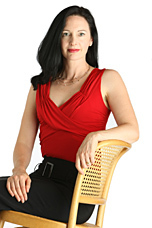 "I now have a home-based business opportunity I am passionate about. I can support my family financially whilst prioritising time with my family. In my universe time is money! I know that the future will be different for us as a family – it will be better!" Imagine what it would feel like to not have to worry about the future market direction and to know you can make money regardless. Imagine living your life to its full potential and achieving the incredible trading results that our other Mentorees have attained. If you want hard-hitting trading education, crammed into 6 thought-provoking months that will turn your trading around, jump on board. What results have people achieved after completing the Mentor Program? we make it hard to fail. Here are some attendees of previous Mentor Programs with their views on the course. Please don’t think this is a get-rich-quick seminar. We won’t be going on a wild adventure, and it’s not like money will magically fall into your lap. We’re far more interested in instilling a permanent life change. Quite honestly, you’ll never be the same person again! This will take a commitment on your part to apply yourself and focus on what we are presenting. It's essential that you're prepared for this, and that you're willing to put your heart and soul into it. I’ve nearly worn myself to a frazzle in the past trying to drag people to success. Unless you really want it, you’re not going to be able to achieve it. However, if you’re the right person at the right time, I would love to welcome you into our thriving trading community. 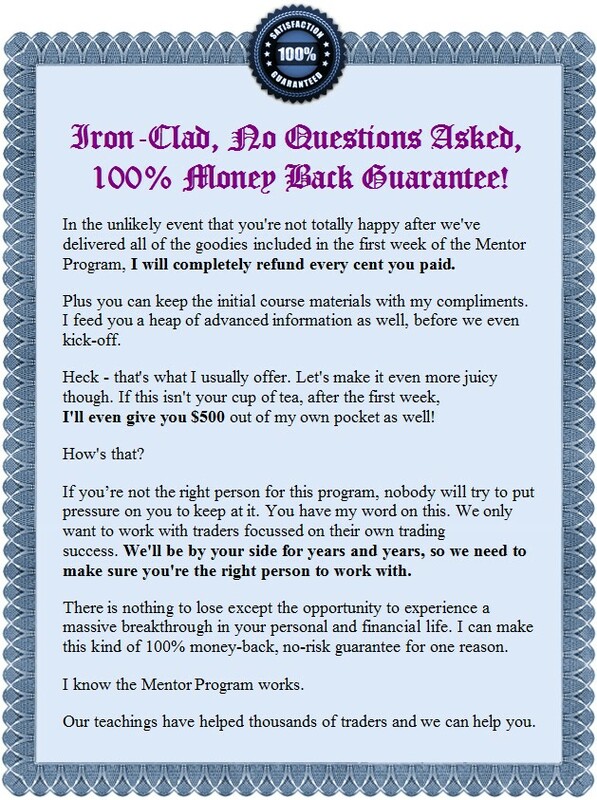 If you’re after breakthrough strategies and techniques, if you want to uncover hidden profits that you never knew existed, and if you’re looking to immerse yourself in the training of two confident, world-recognised traders – then you need to book into the Mentor Program now. Book in now. Later today may be too late. "To be able to repeat is a huge bonus." "There is a lot of content there and you can't absorb it all in one hit, so to be able to repeat is a huge bonus. 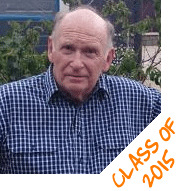 "The Mentor Program has given me some control over my future financial affairs. What we've learned is good for trading but it's also good for our own attitudes in our life circumstances. "I'll have the opportunity to do things in retirement we would not have done instead of living week to week." "The information is given openly..."
"Definitely do it. At least you will learn a ton of information and have the door open to you to be able to start a viable, very lucrative business. "If you want a genuine chance at a magnificent life, I can't see a better, more likely option." "I was trading blindly before..."
When we work personally with clients our rates are up to $1,500 per hour. For the past few years, I haven't been taking on any more personal clients because we can't keep up with demand for one-on-one training. strategies for a fraction of the price others have paid in the past. When you include all of the time and the bonuses that we’re giving you, the full price of the training is valued way over $18,000. But because you’re reading about the course right now, you qualify for our massive early bird special! Make sure you see our Frequently Asked Questions, but come back to this page as quickly as you can, or you'll just miss out... again! book in by 1st December, 2018 and save yourself a bucket-load. Be warned that based on the previous Programs this course is likely to book out in within the next few hours. "Yes Louise, I'm ready to join the 'Attend the Meetings' Mentor Program which includes three face-to-face meetings with you and Chris. I will make a deposit now of $3,248.75 and then just 3 monthly payments of $3,248.75 (and pay only $12,995 in total) as I am booking in as an Early Bird. I am aware that the full course cost is usually $14,995. I want to book in online or by sending you a fax." course cost is usually $13,995. I realise that even though I won't be attending the 3 meetings, I'll be provided with everything I need via video and audio. I want to book in immediately online or by sending you a fax." Click here to download your fax form. 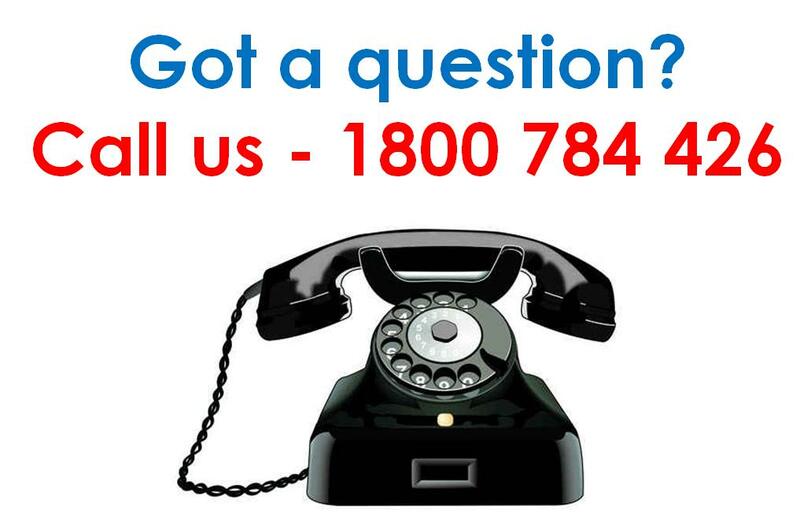 Fax it to (03) 8080 1655. Take advantage of this massive early bird special. It's a HUGE discount whichever way you look at it! For the 6 months, that's just over $64 per day to generate a lifetime of change if you take the 'Complete Online Solution' option. Also, considering our personal training fees, this is an absolute bargain. We've made it really easy for you too because it's all done with payment plans. We’re bending over backwards to keep this affordable. It’s that important. 'Complete Online Solution' option, keep in mind that the Mentorees who are banking the biggest profits are the same Mentorees who attend the meetings and just hang out with us. by being in the same room with us. The people who pick our brains and plug in tight, just seem to kick goals more easily and quickly than those who stay at home - so it will be worth your while to come along. putting up the fee to the full price. You'll kick yourself if you don't move on this, right now. Yes, I want to take advantage of the massive early bird special. the whole Mentor Program than in a full university degree, all packaged into bite-sized, easy to understand chunks. And, I can tell you - any university degree costs a whole heap more than this modest fee. With the correct application of these principles, the rewards to you and your family could be massive. However you must act now before IT SELLS OUT (strictly limited numbers). Talk is cheap - so I'm putting my money where my mouth is. Places are absolutely limited – so it's first in, best dressed. The first meeting for The Trading Game Mentor Program is on Sunday 10th February 2019 in sophisticated, cafe-society Melbourne from 9.00am to 12.30pm. We'll provide venue details for you shortly. Then, we’ll have another meeting at the same venue on Sunday 5th May, which will last for a full day, and a final meeting on Sunday 25th August, so we can all have the day together and have a great, LOONNNGGG lunch, and a laugh. Book your seat before we sell out! (03) 8080 1655. Given the rush though, it would be quickest to book online. You'll also receive our juicy Get a Trading Plan CD, (valued at $225.00), and specific elements of my Candlestick Charting Home Study Course (valued at $695.00). People don’t expect to get so much. These are our gifts to you. These ideas and concepts can be used by any trader to multiply their profits and derive incredible results from the sharemarket. While there are still some places left. If Not The Mentor Program with Louise and Chris, Then What? that the past Mentorees are achieving? potential.We bring all of the knowledge together that we’ve learned from trading the markets, and we give these shortcuts to you. If you’re looking for a power boost to get on the right track to trading success, then I urge you to do everything you can to attend. and personal and you owe it to yourself to get involved. I know you're the type of person who follows through. It's in your heart and your gut to become an exceptional trader. sharemarket and develop the trading tools to last a lifetime. completely original. Chris and I have only ever released these strategies to our previous Mentorees. Because of the incredibly lucrative nature of these tactics, you must promise not to share them with anyone! They are intended for your private gain only. Take Advantage of our Massive Early Bird Discount before the price goes up! 2. Fax me your booking details and I will personally make sure you're booked into the course. Click here to download your fax form to take advantage of our instalment payment option. General Advice Warning - The Trading Game Pty Ltd (ACN: 099 576 253) is an AFSL holder (Licence no: 468163). This information is correct at the time of publishing and may not be reproduced without formal permission. It is of a general nature and does not take into account your objectives, financial situation or needs. Before acting on any of the information you should consider its appropriateness, having regard to your own objectives, financial situation and needs.